Deering jumped out to an quick lead on Thornton Academy, sustained a Thornton comeback in the 3rd and eked out at 50 - 48 win over TA from Portland Friday night. The game came down to a final possession by TA with 16 seconds to play. They were able to get the ball into their go to guy in James Ek, but Deering's defense didn't allow a clean look, and the shot was just right, giving the Rams the exciting two point win. 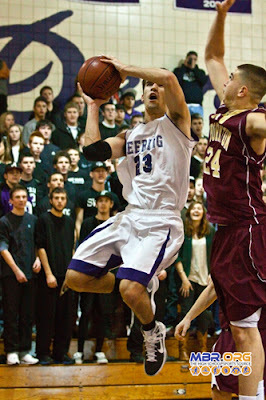 Deering's Jackson Frey got the Rams going early in the 1st quarter with 11 points. He also played stellar defense on TA's perimeter offensive players James Ek and Andrew Shaw. SMAA leading scorer Ek was held scoreless in the 1st and Shaw settled for a bunch of off balance deep 3 pointers. Shaw did help close the gap late in the 1st with 2 big buckets and a pretty 3 pointer. The Rams finished the 1st with a 17-11 lead. The Trojans continued to push the Rams in the 2nd behind some nifty defense and Ek finally getting on the score sheet. Jon Amabile was just about the only Rams player that could get loose, 9 of his game high 22. The Rams held a three point lead at half, 29 - 26. The third quarter was even throughout as Thornton's Justin Pollard tipped in 7 of his 9 points, and Deering spread out it's offense, but got key defensive contributions and big rebounds from Jamie Ross. Ross made life difficult all night for anyone that came into the paint. The 4th quarter was time for the younger Ek to get control, as Adam pushed TA down the floor and bagged 6 of his 8 for the game. His bigger contribution in the 4th was getting the speed game going, and started to penetrate the Rams defense. The Rams Jackson Frey finished with 13. Andrew Shaw led all Trojans scorers with 13.